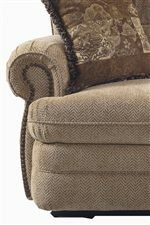 This transitional styled, living room chair is the perfect reclining amenity to add to your casual or traditionally styled living room furniture collection. A relaxation piece that is made in the style of ageless furniture trends, this living room recliner is decorated with nail head accents and welt cord trim. Plush, plump pillows cover the seat and back, giving you a long lasting comfort, with contoured seat cushions for shoulder, neck and lower back support. 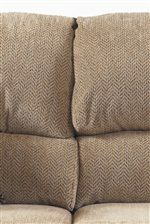 A wall saving item that fits easily into your home, this recliner is a favorite among families and guests. The Hancock Traditionally Styled Wall Saver Recliner by Lane at AHFA in the area. Product availability may vary. Contact us for the most current availability on this product. Arm Flared arms with welts and nail head trim. The Hancock collection is a great option if you are looking for Traditional furniture in the area.